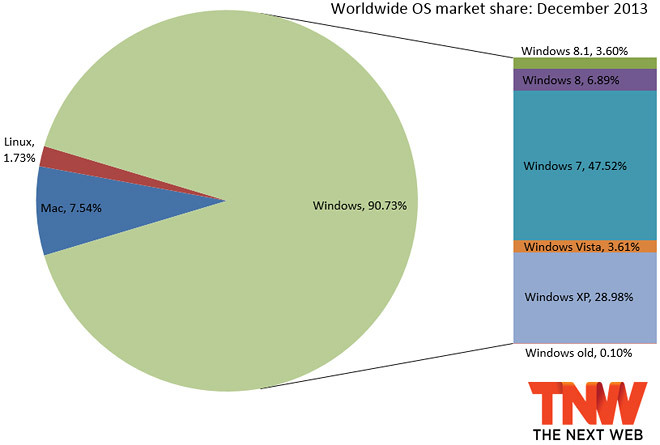 The free Windows 8.1 update was released on October 18 and since then adoption has been growing steadily. Yet the number people who went through with the update is still less than half of Windows 8 users. Windows 7 continued to grow too and, surprisingly, so do Vista numbers. The info comes from Net Applications and points to a combined Windows 8.x market share of 10.49% in December, breaking the 10% mark for the first time since the new generation OS was introduced. The breakdown goes like this – 6.89% for Windows 8 (up 0.23 percentage points) and 3.60% for Windows 8.1 (up 0.96 percentage points). Embarrassingly, Vista has 3.6% – as much as 8.1. At least Windows 7 didn’t outgrow Windows 8 as it did in previous months. Anyway, over time Windows 8.1 is expect to completely replace Windows 8 (again, it’s a free update), even if things aren’t going as quickly as expected. For the first time in many years Windows XP fell below 30% market share. It’s still almost 3 times as popular as Windows 8 though. Windows as a whole lost market share for most of the year, Mac OS X lost some ground in December too, Linux grew by a hair. 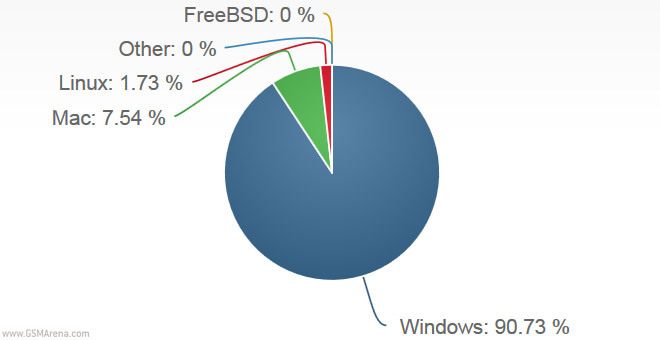 It’d be interesting to see if the Linux-based SteamOS will help push the open source OS to a bigger market share.